Earn 115 - 195 points upon purchasing this product. Niacin functions in over fifty metabolic reactions. It plays a key role in glycolysis, the Krebs Cycle and the hexose monophosphate shunt, all of which are important in the release of energy from macro-nutrients. It is also needed in the deamination of amino acids, essential fatty acid metabolism and in the metabolism of fatty acids. By playing a role in the formation of red blood cells, steroids, and in energy production within the cells, niacin is vital in maintaining the integrity of all body cells. Use 1150 - 1950 points to purchase this product! Vitamin B3, a water soluble nutrient, appears in several different forms, all of which can be referred to as niacin. One of the forms is nicotinamide, (synonymous with niacinamide) which is the form of niacin that is generally recommended for supplements. The chemical structure of niacin is similar to the amino acid tryptophan and in fact the body can make niacin from tryptophan but in times of stress this function can become compromised. Niacin is most abundant in high protein foods such as meat, fish and nuts though the amounts are quite low. Cholesterol, Triglycerides + Reversing Heart Disease: 1,000 to 3,000 mg of niacin a day. Niacin lowers cholesterol more effectively than statins in various studies and also lowers triglycerides. It reduces the blood fats called “very low density lipoproteins,” which have been linked to heart disease and cancer. It improves the blood sugar problems that can lead to damage of the arterial walls. It dilates blood vessels, which improves the circulation to areas starved of oxygen and nutrients. 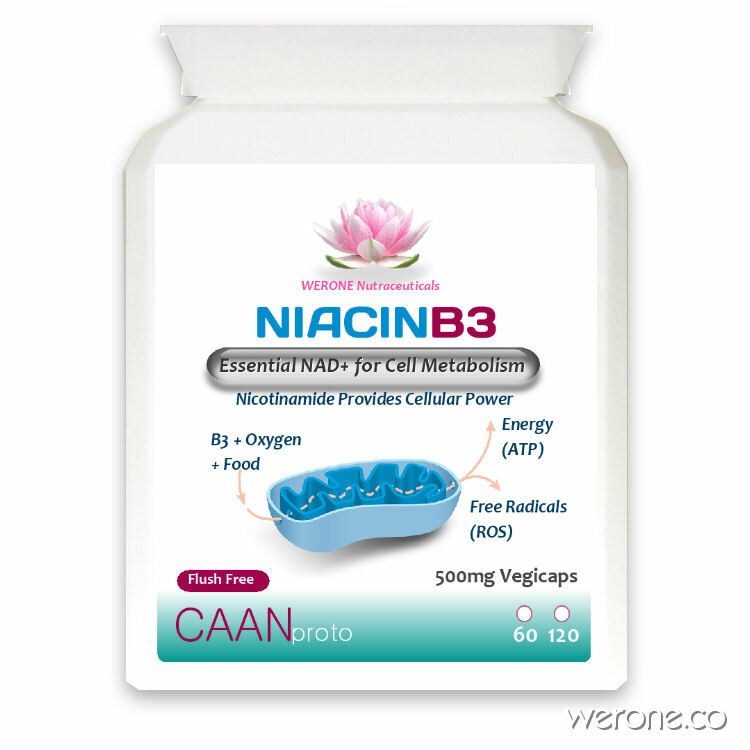 Niacin is an important B3 vitamin naturally produced and synthesized in the liver by tryptophan to produce NAD coenzymes. NAD coenzymes keep the Krebs’ Citric Acid Cycle in the mitochondria of cells functioning normally. It is also implicated in Cancer as a Niacin Deficiency, if there is insufficient NAD coenzymes due to a depletion of tryptophan and niacin [caused by prolonged psycho-emotional stress] then the Krebs’s Citric Acid Cycle of the cell is broken and the cell reverts to glucose obtain smaller amounts of ATP energy for the cell and for the body. When the cell ferments glucose to obtain ATP energy it produces lactic acid, and the somatid (tiny microorganisms necessary for life that live in our blood) pleomorphise (or change) into pathogenic viral-bacterial-yeast-like-fungus to ferment rising glucose and lactic acid, subsequently migrating to the cell nucleus and causing cell mutation and cancer. Fermentation as an alternate means to obtain smaller amounts of ATP energy for the cell and for the body. When the cell ferments glucose to obtain ATP energy it produces lactic acid, and the somatid (tiny microorganisms necessary for life that live in our blood) pleomorphise (or change) into pathogenic viral-bacterial-yeast-like-fungus to ferment rising glucose and lactic acid, subsequently migrating to the cell nucleus and causing cell mutation and cancer. Start slowly with one capsule with food and gradually build up to desired level. Some flushing could occur at high levels but if any nausea is experienced, back off and build slowly again over a longer time frame. My legs were covered with a form of eczema i’ve used nearly a full bottle and my legs are clear. Totally healed up..never going to stop taking these it must be doing other forms of good to the body….im so pleased..thank you! Came promptly and was as advertised, price was good. Great vitamin for skin as recommended by skin specialist. I have already tried some vitamin B3 products and finally ended up with this. – The product is “flush-free”,it does not lead to heat or red face, as can happen with B3 preparations. The capsules are not exactly small, but in case this is a problem they are easy to open. All in all a combination, which is not so easy to find and certainly not with this price-performance ratio. Did anyone else have this side effect? Within 24 hrs i noticed a big difference in my oily skin which had been a humiliating problem for 20yrs. AND also… roughly half an hour after taking one dose i was cracking up with laughter (and i was at home on my own) i think it lifted my mood or at least made me feel very ‘merry’ – but not totally drunk. Weird reaction. This has changed my life. Enormous benefits for me, i actually can’t absorb the mineral when i eat because of a medical problem that was pancreatitis and gall bladder removed which means i can’t break down enough meat fats to produce B3. I do wonder about the education doctors receive, they should really recommend this. My skin, hair and nails have benefitted vastly and i am less tired. Thought this was a great price for quality, will always buy from here.